It took months working beside Drs. Gentempo and Kent to get the philosophy, words, images and implementation of this report of findings scan folder just right. That was back in 2002. It remains one of our most popular report of findings tools. Refreshed in 2014, it presents the results of your Subluxation Station technology with even greater certainty, sophistication and clarity. It's a "magazette" report folder created specifically for CLA doctors. Can your patients convince the decision maker at home? This folder, along with the printouts supplied by CLA present a compelling case for chiropractic care. Explain what your technology measures. Show what the colors mean and how you expect them to change on subsequent re-examinations. Point out the devastating consequences of vertebral subluxation. Place the reports generated by the technologies you use behind the center flap. 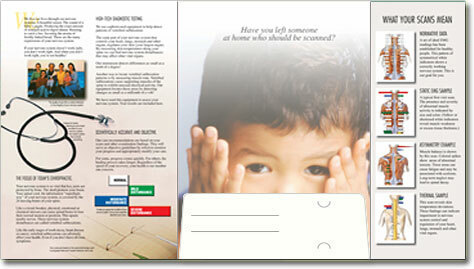 Use the die-cuts on the center flap to insert patient-relevant brochures and your business card to facilitate referrals. On the back cover, review the 16 ways they can enhance the healing process. Increase the value of your scans and the impact of your other report documents by presenting them professionally. Organized. With certainty. It's a contradiction-free way to communicate the nervous system focus of chiropractic. It impresses patients and reassures spouses. Folds to 8 5/8" X 11 1/2"
Review all of our Chiropractic Leadership Alliance supplies shown below. Looking for the CORE SCORE folder with the purple cover and the yellow stripe?